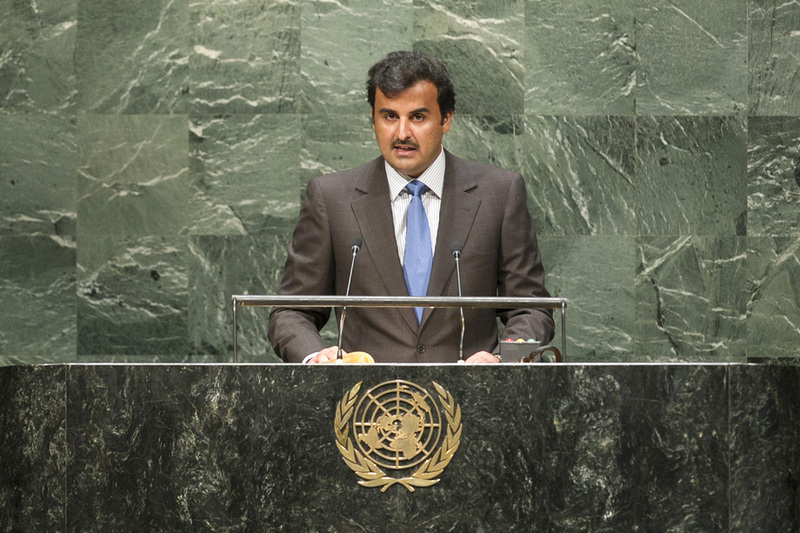 SHEIKH TAMIM BIN HAMAD AL-THANI, Amir of Qatar, said that at this time when the safety and security of all humanity was being affected by the latest developments, compliance with the provisions of international law and respect for the principles of human rights were at the base of achieving international peace and security. Turning to the situation in the Middle East, where he noted that the Gaza Strip had recently been destroyed on a large scale, he said that the "aggression" seen there amounted to a crime against humanity. The Security Council should pass a resolution under Chapter VII of the Charter forcing Israel to take numerous steps ultimately leading to a permanent settlement of the Palestinian issue. Turning to Syria, he lamented the fact that the international community had not acted when Qatar had warned precisely of today's scenario coming to pass. The Syrian people had become stuck between the terrorism of the regime and that of extremist forces, which thrived in the "swamp of violence". The international community should provide "all aspects" of humanitarian aid to the people of Syria, and the Security Council should support Syrians against the "terrorism of the regime" and terrorist forces. The first danger, he said, had begotten the second. Throughout the Middle East and North Africa, he said, terrorism threatened security and stability and hampered development. All civilizations had known terrorism, but the communities from which it sprang were the most affected. That scourge was hostile to diversity and pluralism, which enriched society. The international community needed to stand beside Iraq to lay the foundations for a society free of sectarian and ethnic conflict. In the same context, the Libyan people's aspirations must be supported. Libyan political forces should follow the path of "national dialogue" to achieve a formula for the governance they want. His country was encouraged by the successful transfer of power in Yemen, which he said was the outcome of national dialogue under the auspices of the United Nations, supported by the Security Council. He warned against those who would offer sectarian conflict and factional interests in place of good governance. On the subject of Qatar's national achievements, he listed his country's ranking as thirty-first globally on the United Nations Human Development Index, noting that it would continue to follow its national strategy for development in various fields. Having contributed $2.2 billion in governmental humanitarian aid over the last five years, Qatar would also continue its active role in mediating and providing a platform for dialogue.